This is a guest post by Lee Ann Fujii, Associate Professor at the University of Toronto, and currently a Member Scholar of the Institute for Advanced Study. This post is based on the keynote address she gave at ISA-NE in November 2016 in Baltimore, Maryland. These days most political science department are discussing the need for greater diversity in their ranks. These conversations tend to follow a well-worn path. They never start at Step 1—as in “what do I need to learn to understand this problem?”—but with Step Minus 5, that is, the rash of myths that people assert as fact or common sense. This is whitesplaining academic-style. A typical move, for example, is to claim that we should be careful not to sacrifice quality for diversity. Another is to invoke a single bad experience as “evidence” that pursuing diversity does not necessarily lead to good outcomes. Never is there any acknowledgement of the myriad ways that race already imbues and shapes hiring and promotion practices from start to finish. Rarely is there mention of the power of white privilege to obstruct meaningful conversation and action. Rarer still is there any effort to understand why this topic is deeply personal to many of us, precisely because it is borne out of a lifetime of being raced (and gendered). These interactions never feel like “micro-aggressions;” they feel like highly entrenched macro-aggressions. The concrete pillars of white privilege loom large. Many colleagues would deny that such privilege exists or that they benefit from it. Instead, they couch their reservations about meaningful action in tropes of “merit” and “experience.” Our discipline is not unique in its hostility to the radical notion that nearly all-white faculties are, by definition, expressions of white supremacy. We are the norm. Until last fall, I never talked publicly about this issue. When I received an invitation to give the luncheon keynote address at ISA-NE, I said yes, thinking it would be a good opportunity to give air time to an issue that affects all of us. In the edited version below, I argue that the abhorrent lack of diversity in our discipline keeps us collectively deaf, dumb, and blind to the larger world around us, the very world we purport to analyze and explain. • At the University of Texas at Austin, nearly 42.6% of the school’s 51,313 students are non-white and US-born. • At Rutgers-New Brunswick, the number is 44.8%. • At the University of Washington, the number is 34.6%. The percentage of non-white students is even greater at many of our nation’s liberal arts and community colleges. In short, the browning of America is changing the color of our student bodies even as the academy continues—vigorously and actively—to resist attempts to diversify. The proportion of black faculty at predominantly white colleges and universities today—2.3 percent—is virtually the same as in 1979. Even in fields with a relatively ample supply of minority scholars, such as education and psychology, the proportion of black and Hispanic faculty positions at predominantly white institutions barely approximates the percentages of nonwhites who hold doctorates or professional degrees in those fields (p. 35). The percentage of faculty of color remains paltry at best, particularly at TWIs—Traditionally White Institutions. The figures in Political Science are consistent with these other studies. While the number of women has increased over time, this change has done little to increase the number of faculty of color or to improve the latter’s chances of hiring and promotion. And yet, despite these incontrovertible numbers, many actively resist efforts toward meaningful change. In fact, it would seem that for some, the real problem is the push for more diversity, rather than the lack of diversity per se. Gasman goes on to explain how she came to this somber, but frank conclusion that many of us already intuited. She points to words such as “quality” that faculty regularly use to “dismiss people of color who are otherwise competitive for faculty positions.” The word “quality,” she goes on to explain, means that the person did not go to an elite school or did not have a famous mentor to certify them as “worthy.” The other common claim is that “there aren’t enough faculty of color in the pipeline.” In other words, even if a department wanted to diversity, there just aren’t enough qualified candidates of color to do so. These claims echo the reasoning of Larry Summers, former Treasury Secretary under President Clinton. While president of Harvard, Summers speculated out loud that the chronically low number of women in the STEM fields may be due to women’s and girls’ lower “aptitude” in math and science as compared to men and boys. If women and girls were better qualified, the logic goes, their numbers would “naturally” be higher. This type of essentializing logic also undergirds the claim that the lack of faculty diversity in the social science is a result of “not enough qualified candidates.” Both types of “explanation” turn the problem on its head and locate the source of deficiency not in the hiring committees and their practices but with the scholars of color themselves, who are viewed from the start as less qualified than their white counterparts. Following the same logic invoked by Summers, if scholars of color were more qualified, there would “naturally” be more of them (us) in the academy. Setting aside the specious nature of the claim that certain groups are inherently (or structurally) lacking in quality, this would still not explain the lack of diversity in political science. For if the real issue were truly about quality, there should be no problem with diversifying since the discipline tolerates white mediocrity quite well. Indeed, many mediocre white scholars enjoy long and successful careers. And if the discipline can celebrate white mediocrity, it should be able to do the same with non-white mediocrity, unless, of course, the real reason is not about “quality” at all but rather, the kinds of bodies that faculty see as capable of embodying quality in the first place. Let me give you several reasons why we should all care about the diversity problem in our discipline. First, lack of diversity supports a disingenuous intellectual project. It’s like a white baseball team claiming to be the best in the world when baseball was segregated into white and black leagues. Such a claim is only sustainable if we assume that black players were, on the whole, inferior to white-league players, a claim that no reputable baseball historian would ever make. Similarly, to be one of the best IR scholars today really means to be one of the best white IR scholars, since IR (like the other subfields), is a mostly all-white league in a highly segregated game. Second, lack of diversity helps to support a more general system of white privilege in America and beyond. Majority-white faculties are not simply a product of white privilege—they are producers of white privilege. They teach from privilege, they advise from privilege, they research and write from privilege, and they hire and promote from privilege. When professors teach a PhD seminar, for example, they are teaching students what is important to know and which questions are important to ask, and by extension, which are irrelevant or unimportant. 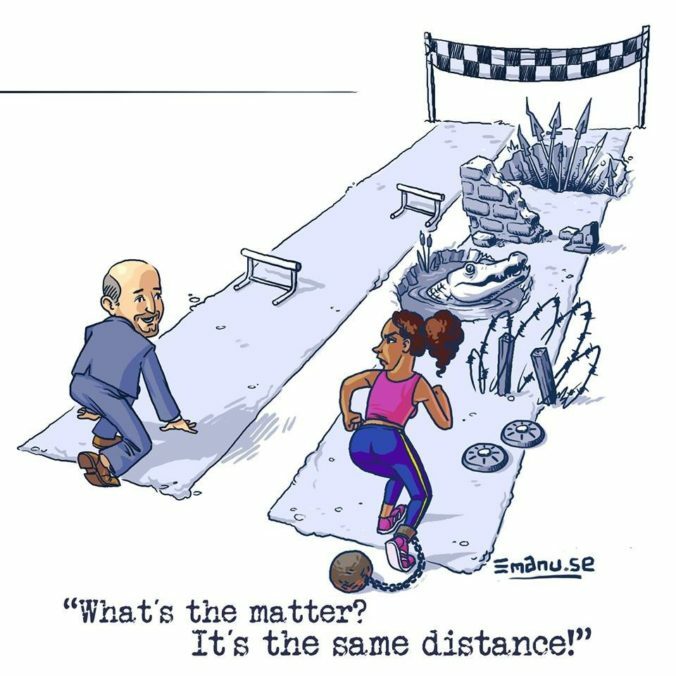 When a “core” Comparative or IR course spends one week on “race” but a whole semester on IPE, it is teaching students that “race” is not worth devoting much time to, but EU trade is. Third, lack of diversity maintains a racialized ways of seeing the world. This lens of default whiteness is assumed to be neutral, unraced, and ungendered, and therefore “scientifically” sound. But whiteness is anything but. It operates from a base of unseen and unquestioned power to dictate not only what is worthy of study, but also what the standards for excellence should be across all studies. The classic example of the structural power of whiteness is DA-RT. Proponents have successfully focused the discipline’s collective gaze on issues that have nothing to do with the type of research many of us do. By doing so, they have drawn attention away from the much more pressing issue of diversity. Fourth, lack of diversity narrows the kinds of conversations we have. Whiteness normalizes race-specific ways of seeing and being in the world; and because it pervades our hallways and classrooms, it necessarily limits the range of discussions we have with one another and with our students. Even when talking about methods, the default assumption is a white researcher for whom questions of positionality are assumed to be moot or irrelevant, rather than constituted by various forms of white (and often male) privilege. Outside the classroom, the same silences are at work. I myself rarely have in-depth conversations about race, racism, or diversity with white colleagues. Those conversations quickly go nowhere and it takes too much effort to inform people about issues they could easily educate themselves on if they simply tried. I do, however, have these conversations with students who seem eager—hungry even—to engage with these issues. They can see, even if my colleagues cannot, the extent to which all politics is raced and gendered. You should care about diversity because in the long run, it helps you. It helps you intellectually and socially. It can expose you to ways of looking at the world that may be unfamiliar or foreign to your own thinking. It can help you to see and question things you take for granted. It can help you to think about the world in more critical and nuanced ways. What I am calling for is a revolution in our collective thinking and acting, an overturning of the ancien régime so that we might all become better scholars, teachers, and colleagues. I am urging you all to join in a concerted effort to push the discipline into a mode it naturally resists in response to a problem that it refuses to recognize, let alone address. Your job in this endeavor is to watch and listen, but with a critical ear and eye. Challenge claims of “merit” and “quality” that go unchallenged. Ask why the canon—as taught in your courses and required on your comprehensive exams—includes so few works from female scholars and scholars of color. Dare to argue that the politics of race or gender is worthy of study and merits more than a single week’s worth of readings. Insist that overlooked topics and questions are at the core of politics and not ancillary to it. Dare to point out the biases and blind spots of the “mainstream,” expose it for it is—one and only one way of examining a part of the world and not always the most important or pressing part. And above all, do not settle for mediocrity. Rest in peace Lee Ann Fujii.